Muscat, (Gulf Intelligence) – Oman, which has tripled its domestic natural gas consumption over the last decade, should prioritize strategies for reducing the national demand for power rather than investing in delivering new energy supplies to meet the country’s soaring call on energy, a Gulf Intelligence survey of 200 Omani energy executives and officials reported. There is a two-part solution to the Sultanate’s energy transition challenge. The first is reducing emissions stemming from energy supply by increasing the share of zero-carbon energy into the supply mix, such as wind and solar. 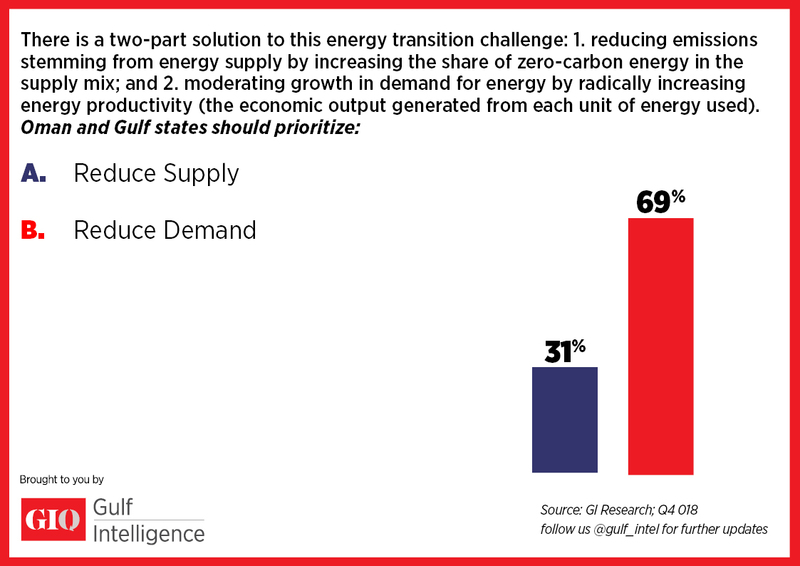 However, it’s the second solution -- moderating growth in demand for energy by radically increasing energy efficiency and productivity – that received the support of 69% of those polled in the GIQ survey conducted in Muscat on November 27. Oman’s total domestic use of natural gas tripled from 381,519 million standard cubic feet in 2008 to 1,447,422 million standard cubic feet in 2017. The country’s semi-arid environment, reliance on air conditioning, rising standard of living, growth in energy-intensive industrialization, population growth, introduction of new households, and infrastructure investments are factors behind the dramatic increase in domestic demand for energy. Oman has one of the world’s highest solar densities and has already made some significant steps towards its Energy Transition strategy in its goal to generate 10% of its power supply from new sources of renewable energy by 2025, and a majority of those surveyed in the GIQ poll were confident that Oman would achieve this target. The increasing profitability of clean energy activity, especially solar-generated power, has come to drive exponential growth in global annual investment – amounting to more than $333 billion in 2017 – and local jobs to support the deployment of products and services. 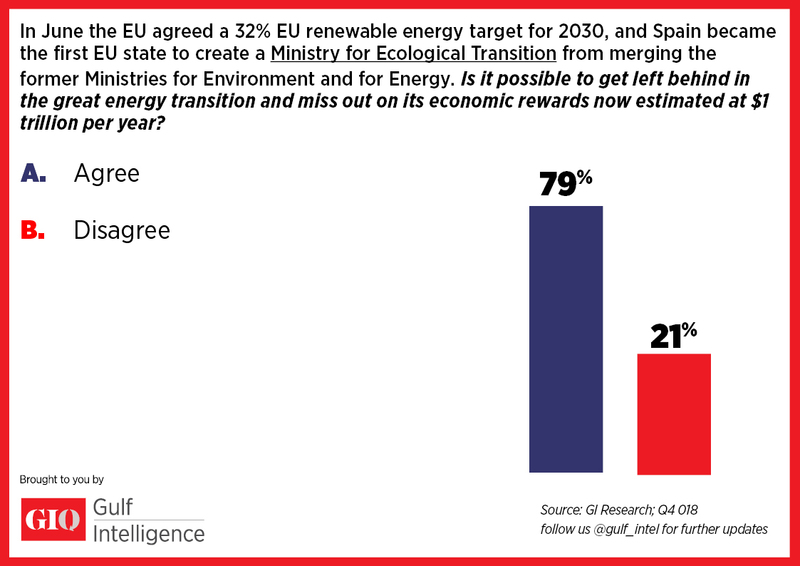 Households, businesses and governments are now increasingly seeking these new energy solutions due to the real economic value they can provide, and 79% of survey respondents felt Oman risked missing out on the economic rewards available if it didn’t accelerate implementation of new energy transition policies. The move towards adopting energy transition strategies across the Gulf region is propelled by an urgency triggered by rapid consumption, which has grown by 8% annually since 1972, compared to 2% for the world. Together, four of the six GCC countries (Kuwait, Qatar, Saudi Arabia, and the United Arab Emirates) have less than 1% of the world’s population, but account for more than 5% of global oil consumption.